45lb pumpkin. about 4 hours of work. i received numerous compliments from the kids and the parents on halloween night. next year will see if i can find a 100lb pumpkin, and a much more intricate design. Wow..that is really awesome. Love the "picture" too . 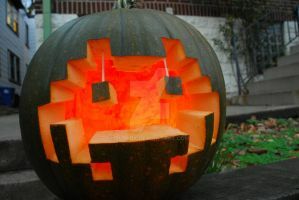 I don't know if I'd be able to carve a pumpkin that awesomely xP. thank you. and it isnt as hard as you would think, u just need to plan well.